Our winery is located, as the crow flies, right around 100 miles directly north of San Francisco. However, there is no direct road, so it takes around 2 1/2 hours to drive from San Francisco. People usually take two different routes to get up to see us. You can take highway 101 north through Marin and Sonoma Counties. Just after crossing in Mendocino County, you will come to the town of Hopland. Take a right turn and head east on highway 175 over the Hopland Grade. We are 20 miles from Hopland. 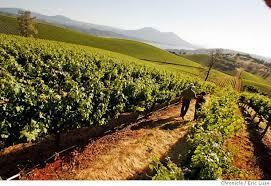 Or you can drive up through the Napa Valley, staying on highway 29 all the way, coming over Mt. St. Helena. We are located on highway 29 halfway between the towns of Lakeport and Kelseyville. "We ferment this wine in stainless steel tank, with minimal oak aging. This Chardonnay shows citrus and mineral characteristics with a hint of stone fruit flavors and bright acidity." Wilfred Wong of Wine 89"Showing loads of jar-jam character, the rich and enticing 2015 Jed Steele's Shooting Star Zinfandel shows up big time on the palate. The wine's ever-flowing berry flavors pair it nicely with a spicy crispy-skin pork chop. Bright, fresh fruit aromas of cherry, raspberry, and blueberry fill the glass. Youthfully exuberant with lots of sweet fruit on the palate with hints of spice and vanilla. So versatile with food fish, fowl, beef, pasta...the perfect house red!